Hair loss can be extremely difficult to accept and deal with especially for women. However, if you understand the common causes of this condition, you can take steps to prevent it or reduce its severity. Since women's bodies work differently than men's, the most common cause of hair loss for them is hormonal, rather than genetic. Changes in hormone levels, such as those seen with Menopause, Pregnancy, Thyroid Conditions, or the stopping or starting of birth control pills or hormone replacement therapy, can cause Temporary Hair Loss in women. When certain hormones, like oestrogen or testosterone, are produced more rapidly or their production is reduced, certain changes in the body can lead to hair loss. For example, after a woman gives birth to a baby her hormones may enter a resting phase while the body returns to its pre-pregnancy state. During this period, usually three to six months after delivery, women may notice an increase in hair loss. Fortunately, the hair loss is usually temporary and tends to subside in about 12 months. If hormonal changes are not responsible for your hair loss, the condition could be brought on by harmful hair care techniques, stress, illness, an unhealthy diet or hereditary. Since most women spend a lot of time styling their hair, this over-handling can be a common cause for hair loss. Colouring, bleaching and perming your hair can cause damage to the hair follicles and cause hair loss. So can aggressive brushing, shampooing and the wearing of tight hairstyles like braids or ponytails. Stress and infections can also lead to hair loss. Stress can increase the amount of hormones that circulate through the blood stream and can also cause problems with the body systems responsible for hair growth. Infections can disrupt the normal operations of the body's system and cause problems with normal hair growth and patterns. 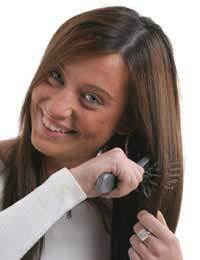 Another common cause of hair loss in women is poor diet. Women who follow a strict diet and lose weight too rapidly can experience temporary hair loss, as can women who do not get enough protein, zinc, fatty acids, or vitamins through food consumption. Finally, women can experience hair loss for the same reason as men. Female pattern baldness is a hereditary condition that results from a reaction to testosterone in the body. When the testosterone is converted into DHT the compound attacks hair follicles and causes baldness. Although this condition is very similar to Male Pattern Baldness, the hair loss is usually less severe. Since most of the causes of hair loss in women are temporary there are things that you can to do eliminate the condition. Start by following a healthy diet plan to ensure that your body is getting the proper nutrients it needs to promote optimal hair growth. To further reduce the chances of hair loss, add an exercise program to your plan. Exercising will improve the delivery of the proper nutrients to your hair follicles and reduce the effects of stress on your body. In order to reduce the occurrence of hair loss you can also take steps to decrease the amount of damage that you do to your hair during normal styling. If you colour or chemically treat your hair, consider stopping the practice before permanent damage is done. You can also try using a gentler shampoo, gentler hair care techniques and the avoidance of tight hairstyles. Although you cannot eliminate illness, some hormonal changes, or genetics, you can take extra precautions to help protect hair growth. If you are sick, talk to your doctor about ways you can prevent hair loss. If you are pregnant, going through menopause, or experiencing other hormonal changes, be gentle with your hair, use a shampoo formulated for increasing body and volume, eat foods rich in soy to help protect hormonal health. Although the causes of hair loss in women are many, they are usually temporary and easier to control once you understand them and your options. We all aim to make our hair look the best it can, but did you know that shampooing your hair too often or using too many styling products in your locks can be harmful? Find out more in our article Overdoing Hair Care. The ultimate hair loss solution is hair Transplants. Hair transplants are more successful and require fewer treatments when done with mild or moderate hair loss.